The Canadian Army has had a continual presence in the Canadian Forces Base (CFB) Shilo area since 1910 when Camp Sewell was established five kilometers northeast of the present base to train Militia infantry, cavalry and artillery units of Military District No. 10 (Saskatchewan, Manitoba and Northwestern Ontario). In 1915 Camp Sewell was renamed Camp Hughes in honour of the Minister of Militia, Sir Sam Hughes. Over 38,000 Canadian troops were trained in trench warfare at Camp Hughes prior to being shipped overseas to Europe during the First World War. Camp Hughes remained open for summer training until 1933 at which time operations were transferred to the newly established Camp Shilo. Artillery training occurred throughout the 1930s and intensified during the Second World War with the establishment of the A3 Canadian Artillery Training Centre (CATC). After the war, the A3 CATC became The Royal Canadian School of Artillery. Additionally, Shilo was recognized as the Home Station of Field, Medium and Anti-Tank Gunners. 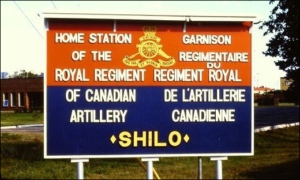 Camp Shilo became Home Station of Gunners of all branches of The Royal Regiment of Canadian Artillery in 1960, as a result of the closing of the Coastal Artillery and Anti-Aircraft Schools at Halifax, NS, Esquimalt, BC and Picton, ON. The status of CFB Shilo as Home Station for all Gunners was affirmed by the CDS on 04 September 1968. The RCA Museum and The Royal Regiment of Canadian Artillery Regimental Headquarters are co-located at the Home Station. Information on CFB Shilo may be obtained at: http://www.army-armee.forces.gc.ca/en/cfb-shilo/index.page.